Government is shaping the political discourse for citizens through projects like Faith on the Frontlines which manufactures an opinion supportive of the British militarism, and promotes a state-friendly understanding of historical events among children. Attempts to mainstream PREVENT include embedding its propaganda in the education system. There are a worrying number of initiatives which seek to control, shape and initiate behavioural change using religion. These include co-opting imams with security services in a project in Derby, the ‘British or Muslim’ project with a sports club London Tigers which uses Quran and Sunnah as a basis to justify PREVENT narratives, and the exploitation of female Islamic scholars to disseminate PREVENT propaganda in their study circles in Leicester as part of the project STR!VE. Worryingly, despite no legal requirement for madrassas to implement the Prevent Duty, the Home Office document demonstrates that third-party security contractor firms are already being funded by the state to roll out PREVENT propaganda within these religious institutions, despite there being no evidence to link madrassas with terrorism. Faith Associates and HA9 Consultancy are two such organisations. A big theme of the document is increasing “critical thinking skills” in order to challenge “extremism”. The concern is not that critical thinking is being encouraged, but that there is a certain type of thinking being administered to children, one that encourages compliance with the state, which is really not critical thinking at all. This sets a precedent for wider state control in other communities and in other spheres. Organisations such as the Active Change Foundation and Reveal Theatre between them target 5000 Muslim youth. The Reveal Theatre lists among its resources the neo-conservative groups Quilliam Foundation and the Institute for Strategy Dialogue, as well as Faith Associates and Imams Online, both PREVENT propaganda tools. A number of PREVENT projects targeting Muslim women and women’s organisations shows how the state views women as tools for their narratives to gain traction and validity, abusing the trust women have built up over the years in their communities. The ability to deconstruct “extremist narratives” is categorised as a “vulnerability” which may result in a Channel referral in children as young as fourteen years old. The government will “focus on engagement with mosques in order to develop safeguarding pathways to challenge extremism and increase community referrals to Channel” thereby raising issues around mosque trust and community cohesion. With the government not only interfering with political and religious views, but actually making rigorous attempts to steer them in order to support state policy, Britain is slipping towards totalitarianism and the fear-based PREVENT policy ensures we keep sleepwalking towards a closed society. Britain’s debilitated soft power strategy known as PREVENT lingers on, with its proponents applying various types of plasters and sutures to desperately prop a terminally wounded policy. Whether it is the claim that PREVENT is safeguarding, that the study underpinning it is “peer-reviewed”, or that PREVENT is not discriminatory, the overstretched PR campaign to architect an image of viability has come in various forms and varying grades of superficiality and desperation. Recently, transparency group Public Interest Investigations published the leaked Home Office document entitled “Prevent Strategy – Local Delivery Best Practice Catalogue”. In contrast with stories revolving around Muslims, mainstream media activity around this revealing document has been notable only by its absence. However, there are some disturbing – though completely PREVENT-concomitant – themes which emerge from the document. With echoes of the Schmittian totalstaat, the document reveals the disconcerting trend of how government is shaping the political discourse for citizens. The very first section of the document is called “Ideology” and concerns national and local “counter-narrative” products. Under the sweeping guise of “combatting extremism”, a selective narrative friendly to the status quo is being disseminated and championed by the state. “To promote the work of Muslims in our Armed Forces by showing their role in Afghanistan, and undermine the extremist narrative that we are at war with Islam and that the 2014 drawdown was a victory for the Taliban”. The views on what the 2014 Afghan drawdown mean vary among the public; many would baulk at promoting state militarism to children, and given outgoing prime minister’s speeches promoting “moderate” and “reforming voices” which incidentally undermine orthodox Islamic beliefs and practices as well as the Casey Review which highlights traditional Islamic rulings as “extremist”, some may be forgiven for thinking elements within the government are on their own crusade against Islam; but is it for the state to target Muslim children in particular to enforce a particular version or interpretation of events, and to categorise an opposition to this version as “extremist” and therefore a “pathway” to terrorism? “It shows a positive image of British Muslim identity, and addresses core radicalising narratives around Afghanistan by showing the positive legacy of intervention”. Again, the implication here is that opposition to militarism in Afghanistan is perhaps a “negative” portrayal of British Muslim identity, coercing the discourse towards an state-ideologically-defined “ideal”. The ramifications for political activism in addition to the discriminatory focus on Muslims is self-evident. Education is not only used to entrench PREVENT, but also to disseminate a particular, politicised narrative of history. Continuing the theme of control and discrimination through PREVENT is the area of theology. There are a worrying number of initiatives which seek to control, shape and initiate behavioural change using religion. 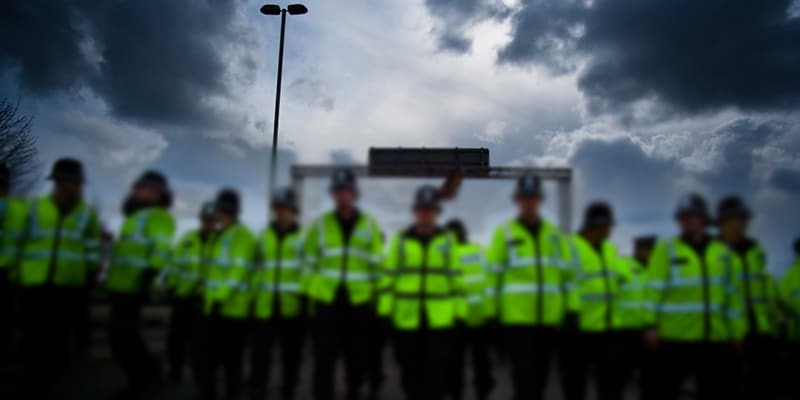 Targeting Derby, a PREVENT projects in place seeks to leverage Imams to challenge “extremist propaganda” and further, to work with police and authorities to respond appropriately. Taken to together, the securitised function of the Imam raises ethical problems for those who attend mosques. Can they still trust an Imam who has been the receptor for a structurally flawed policy? The Derby project also establishes 3 forums to discuss Islam and the role of women. The question of course here needs to be raised; why are “discussions” about Islam and the “role of women” being funded by the state under the banner of PREVENT? “This project, delivered by London Tigers, is a series of interactive workshops which use real life examples of extremist propaganda espoused by known extremists, taking a counter narrative from the Qur’an and Sunnah”. The outcome of this project was that a “greater depth of theological knowledge” was achieved amongst the 150 “young people” who had participated in the project. In other words, the Qur’an and the Sunnah (Prophetic tradition) are being used to prop state narratives designed to combat undefined “extremist propaganda”. Given opposition to PREVENT has been categorised by state officials as an example “extremist narratives” (Casey Review), this sets a worrying precedent of co-opting and funding a particular understanding of religion to validate the state in a manner not dissimilar to authoritarian regimes. Focussing on women in the context of theology, the document also highlights a Leicester-based organisation “STR!VE”, which seems to have exploited female Islamic scholars (Alimas) to serve and promote the PREVENT policy. The document asserts that the project, the contact point of which is Will Baldet, spent £18,565 for two trainers to do ten courses. The project “builds the knowledge and capability of women to respond to extremist propaganda”. It seeks to manipulate Alimas to become the eyes and ears of the state and promote PREVENT “within their study circles that they educate in their homes”. Furthermore, a “web presence” has been developed for women to refer to these PREVENT propagating Alimas any questions they may have. STR!VE has trained 135 women under the project. JAN Trust has also been a recipient of PREVENT funding for its “Web Guardians” initiative to tackle online radicalisation. Again, the state is seen here funding the interference of religion, with claims that mothers have discussed “the true meaning of ‘jihad’”. Every “best practice” example highlighted under this section relates to the Muslim community. The document affirms the rise of third-party security contractors raised by CAGE in the report “We are Completely Independent”, which are being used to project the PREVENT Strategy. Thus, in the case of Upstanding Neighbours “community influencers and activists” are being contracted to challenge “extremist propaganda”. The women’s ‘counter-extremism’ organisation, Inspire, is also confirmed as having taken funding for its “Making a Stand” PR campaign to “to transmit HMG counter-extremism messages”. With the Active Change Foundation, a Youth Club membership requires a “commitment to attend a number of workshops” where young people are monitored for “potential vulnerabilities”. The document claims that with a membership of 2000 young people, all members have “received PREVENT messaging”. A big theme of the document is increasing “critical thinking skills” in order to challenge “extremism”. A concern is the type of critical thinking being administered to children. Targeting school children aged between twelve and fourteen, Reveal Theatre has facilitated the participation of 3000 pupils between 2013 and 2014. The website claims that practitioners use primary sources of “extremist organisations as collated from the internet”. A question is to be raised as to how they decide the “extremist” from the “non-extremist”. In the resources section, Reveal have a link to an article produced by the Washington Institute which declares all strands of political Islam (Islamism), including groups like the Muslim Brotherhood, as “extremist”. As Peter Oborne noted upon the publication of the review into political Islam by the Foreign Affairs Select Committee, this is a faulty neoconservative narrative. More disconcerting still is the fact that discredited neoconservative-associated groups like the Quilliam Foundation, and Institute of Strategy Dialogue (ISD) are listed among the resources. The ISD resource link is a paper authored by Erin Saltman, who was a former employee of the Quilliam Foundation. The former longstanding board of trustees for ISD was George Weidenfeld, a person whom the neoconservative Michael Gove has named as his friend and inspiration for his book Celsius 7/7 (Gove, M., Celsius 7/7, Weidenfeld & Nicolson, London, 2006, p.141). Gove has been listed as an advisor to the Quilliam Foundation. Imams Online, which is a product of the aforementioned, PREVENT-funded Faith Associates is also listed. In short, the “critical thinking” being propounded here by Reveal, is one which is firmly planted within neoconservative conceptions of radicalisation, extremism and “Islamism”. FIDA has developed a “comprehensive curriculum” from lessons plans and peer development to tailored interventions and “using an online character to discuss prevalent issues”. At least one aspect of this package has been utilised by all twenty secondary schools in Waltham Forest. “Compared with traditional engagement with men, it was noticeable that engagement with women penetrated communities more deeply. Women’s groups have significant reach, and women’s informal networks are also very effective at disseminating messages”. A number of PREVENT projects targeting Muslim women in particular are evident from the Home Office leaked document. Blackburn has been subjected to PREVENT activity for years. The REACH project, deployed in Blackburn and Darwen, has an explicit mandate to “help individuals in women’s groups” within the faith and education sectors, which includes Imams and madrassah teachers, with workshops which “focus on Muslim women and their role in tackling extremism” in order to “enable them to promote Prevent”. 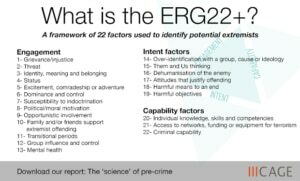 Ability to deconstruct “extremist” narrative a sign of vulnerability? 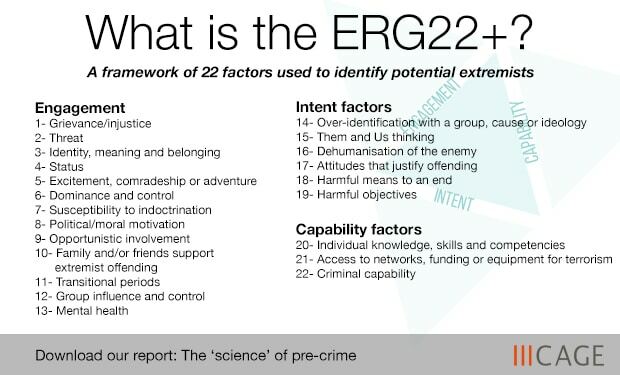 Where the government has been unable to furnish a legal definition of “extremism”, it is shocking to note “deconstruction of extremist narratives” as a “vulnerability” which may result in a CHANNEL referral. What makes this more perverse is the target age range for this £238,290 project includes teenagers as young as fourteen years old. Channel vulnerability factors. Click to enlarge. As noted by many academics, PREVENT damages the very fabric of society. The document surfaces dedicated PREVENT projects to entrench this mistrust further into communities. Last year’s CAGE report, “We are Completely Independent” revealed that “KIKIT: Pathways to Recovery” had links to PREVENT, which were not clearly stated as such on the organisation’s website. KIKIT described itself as “black minority ethnic specialist recovery focused service that provides substance misuse support, also appears in a promotional video for Upstanding Neighbourhoods.” The Home Office document confirms that KIKIT was funded by PREVENT to deliver its “Pathwayz” project, with Birmingham PREVENT manager Waqar Ahmed a designated contact point. There are serious concerns related to the mosques involved and the trust issues which they inevitable result in due to their absorption into the PREVENT surveillance apparatus. The document also demonstrates how a referral to Channel is being used as a backdoor for state ideology to penetrate the family home. Under the slide “Strengthening Families, Strengthening Communities”, parents of “groups identified as being vulnerable to radicalisation and referred through existing safeguarding practitioners” are being enrolled on PREVENT courses where they also “gain an increased understanding of British Values and how they and their children can be positive contributors to British society”. 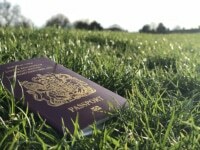 The concerns raised here have been noted before however, the Home Office leaked documents provides an opportunity to place key themes together, step back and discern just how extensive a security policy PREVENT has become. From targeting public sector workers, to civil society activists, from state interference of religion through mosques and Imams to the weaponization of women as avenues to entrench PREVENT deep into Muslim communities, to primary school pupils and the home. Every section and level of society, particularly in the Muslim context, is being co-opted into a military propaganda strategy. It is for policy makers and indeed the rest of society to ponder the implications of this. How is PREVENT able to permeate society so deeply given the original classified study underpinning PREVENT, as exposed in our ground-breaking report “The ‘science’ of pre-crime: The secret ‘radicalisation’ study underpinning PREVENT”, was only targeting a small sample of TACT offenders and was never intended by the authors of the research to apply outside of this tight remit? This question is all the more burning given over 140 experts have criticised PREVENT on this very basis. What is indeed the difference between Middle East authoritarian regimes which abuse religion to validate their rule, and the British state which is pouring funding into organisations to facilitate the “right” kind of religion? The Home Office leaked document makes a number of references to “PREVENT priority Areas”. Coupled with the fact that the projects highlighted therein target Birmingham, Blackburn, Derby and East London, is it safe to assume that “PREVENT priority areas” is a euphemism to discriminatorily target Muslim communities? What are the 5 “PREVENT Priority Areas”, how are they defined and who defines them? Finally, with a state disconcertingly interfering with political and religious views with an intention to support state policy, is Britain slipping towards authoritarianism? This raises the need to urgently address a worrying drift towards a closed society.